DUBAI: Malaysian Prime Minister Datuk Seri Najib Tun Razak arrived here Sunday to attend the 10th World Islamic Economic Forum (WIEF). Najib and his wife, Datin Seri Rosmah Mansor, arrived in a special aircraft that landed at the Dubai World Central Al Maktoum International Airport here at about 9.30pm (1.30am Malaysian time on Monday). From the airport, the couple departed to the Madinat Jumeirah Hotel Al-Sufouh Road and were received by Minister of Agriculture and Agro-based Industry Datuk Seri Ismail Sabri and Minister of Domestic Trade, Cooperative and Consumerism Datuk Seri Hasan Malek. 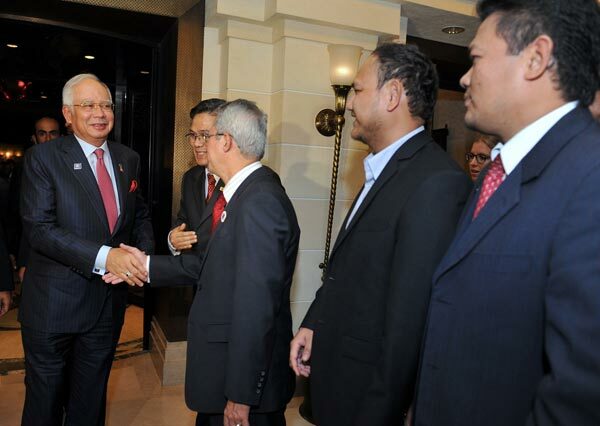 Present were WIEF Foundation Chairman Tun Musa Hitam, Malaysian officials and WIEF officials. Najib, as the Patron of WIEF Foundation, will deliver a special address during the opening session on Oct 28. He is expected to hold bilateral meetings with his counterparts during the forum to discuss bilateral, regional and international issues of mutual interest. Themed, “Innovative Partnerships for Economic Growth”, the three-day forum will be held in Madinat Jumeirah here until Oct 30. WIEF is organised by the WIEF Foundation in collaboration with the Dubai Chamber of Commerce and Industry. The 10th WIEF aims to forge greater collaboration between nations, bringing a new era of prosperity for the global economy.